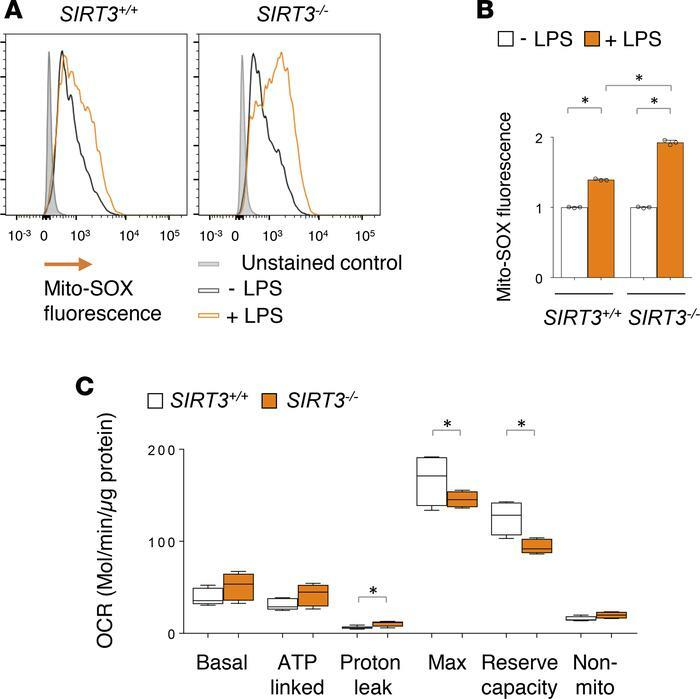 The effects of SIRT3 on macrophage mitochondrial ROS formation and bioenergetics. (A and B) Representative histograms (A) and quantitative analysis (B) of MitoSOX fluorescence in control or LPS-treated peritoneal macrophages obtained from SIRT3+/+ and SIRT3–/– mice. Data presented as mean ± SD (n = 3). *P < 0.05 (ANOVA). (C) The oxygen consumption rate (OCR) in SIRT3+/+ and SIRT3–/– macrophages. Indices of mitochondrial function include basal, ATP-linked, maximal, reserve capacity, proton leak, and non-mitochondrial oxygen consumption. Data presented as mean ± SD (n = 3–6). *P < 0.05 (Student’s t test).